When it rains in Saigon the streets gradually empty of motorbikes. They disappear like birds at night. But in all but the monsoon season, the rains don’t last terribly long, and soon enough the motorbikes emerge again, one at a time, from the alleyways and the invisible niches that make this city magical. In full force, the motorbikes swarm through the streets, reflecting the tension of opposites that appears to be more present here than in many other places I have been. At once the motorbikes appear to reflect a society that huddles together, that moves within the protective membranes of family and ethnic identities, and yet there is the pronounced nudging and blistering off of the single motorbike driver; and it is rarely clear when some anonymous bike will dart away from the others in a random vector, rudely declaring its independence from the pack. And there are those few who dare to travel against the pack, weaving their way through the swollen mass directly toward you, like a lone salmon finding its way upstream. The riders on the bikes in the pack somehow don’t appear to feel violated as they veer off to let the intruder through, don’t appear shaken, as if they are somehow recognizing that this is an ineluctable fact of life: that wherever you go and whatever you do there will be someone flinging an obstacle your way that must be dodged. I wrote those few paragraphs a couple of years ago on a business trip to Saigon. 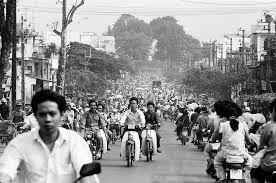 On my first trip to Vietnam, I walked everywhere I went, the second I mostly took taxis and got lifts from associates, and by the third I graduated to motorbikes, the way the locals do it. It is unreservedly a motorbike culture, although the last time I was there I was told there was a governmental move to ban them from the city. One of the staff members at the company where I worked told me that you judge people’s social status by the motorbike they drive, which I suppose is no different from the U.S., although we do it here with cars. It is frightening to ride your motorbike against the swarm of traffic. In fact, it can be terrifying, but the motorbike riders of Vietnam take it in stride. They are tough and resilient, and don’t appear to bat an eye at the danger coming toward them, if in fact they perceive a danger at all. As often as I have happily ridden with the crowd in my life, I have also learned the value of riding toward and against it. If you speak up against authority in an organization and they punish you for it, then you are in the wrong organization. Better organizations value dissent. Prior to starting my own company, in which I proudly welcomed criticism, I had a pretty stellar run in two non-profits. In both of those organizations I started on a low rung and left on a high rung. The pattern was simple: work with the pack, develop relationships with the leaders, and make constructive recommendations designed to further the mission even when that meant radical changes to the status quo. Such an approach doesn’t always work. Staff rebellions took place in both organizations, and in one, those who complained vociferously were fired, and subsequent to their dismissal, almost as if in spite, administrators implemented their recommendations. The staff were fired, I believe, because the constructive elements of their criticisms were buried beneath personal antipathies. They focused more intently on what was wrong with the organization than on intelligent solutions that met the needs of all stakeholders, and the leaders of the pack were more intent on punishing insurrection than in maintaining a pack of discontented employees. It isn’t always fun to ride against the pack, yet while it can be hazardous, the rewards can be substantial. Fortunately, in every instance where I stood up to authority and rebelled against the status quo, I was rewarded, whether it was getting a better night’s sleep due to an enhanced feeling of integrity or rapidly being promoted. But as bold as I may become, you won’t find me intentionally riding through a long pack of motorbikes in the opposite direction. In an organization, pretty much the worst thing that can happen to you by insisting on going up the down staircase is that you will get pink-slipped. On a motorbike, well, the pink may turn out to be blood and the slip may be more of a collision, and with all those bikes coming at you, that could end up being one singularly bad day. Ira, I always enjoy reading your articles. This one I loved! So many points of intersection with my own universe: motorcycles, Southeast Asia and managing a business… Thank You & Be Well! Again, so well-written and reflective! Should be a must read for highschoolers and beyond!